Surveillance cameraTest.com (12/15): Note: "good" (1.6) Conclusion: "The OctaCam spy camera in lighter look costs a little more than comparable gadgets of this kind. However, the model presented here counts for the best in terms of processing quality as well as video recording what we have been able to test so far. Sharp images and good colour reproduction, along with some other useful features, make the lighter video camera a recommendation." It looks like a normal lighter and you casually light up a cigarette - which nobody notices: the hidden camera films everything around it. So you can film unnoticed e.g. the cheerful round at your barbecue or garden party. Naturally in high definition full HD and with sound. Practical: videos are automatically saved in 3 minute clips. The built-in LED flashlight brings light into the dark, even during your recording. Your recordings land directly on microSD card. 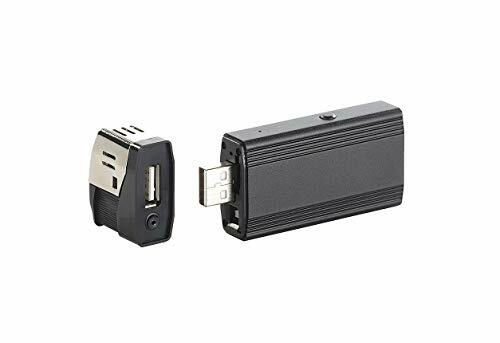 Thanks to this, you can also use the Spy Cam as a USB stick: your important data and also recordings are always with you. Connected to the USB port of your computer, you can transfer your videos to the hard drive quickly. Clever: connected to the PC, you can use the camera in lighter look as a webcam.